Thomas Ludwig Werner Freiherr von Fritsch (4 August 1880 – 22 September 1939) was a member of the German High Command. He was commander-in-chief of the German Army from 1933 until February 1938, when he was forced to resign after being falsely accused of being homosexual. Fritsch was born in Benrath in the Rhine Province of the German Empire. He entered the Prussian Army at the age of 18; in 1901, he transferred to the Prussian Military Academy. In 1911, he was appointed to the German General Staff, where he served during World War I. For in the last resort Ebert, pacifists, Jews, democrats, black, red, and gold, and the French are all the same thing, namely the people who want to destroy Germany. There may be small differences, but in the end it all amounts to the same. The German historian Wolfram Wette wrote that Fritsch had come close to high treason with his letter as Fritsch had taken the Reichswehreid oath to defend democracy, and in calling for a putsch to destroy the democracy that Fritsch had pledged to defend was an act of "...extreme disloyalty to the republic to which he had sworn an oath". Fritsch was heavily involved in the secret rearmament of the 1920s, in which Germany sought to evade the terms of Part V of the Treaty of Versailles, which had essentially disarmed Germany, limiting the country's Army to 100,000 soldiers, plus destroying all its aircraft and tanks. As such, Fritsch who worked closely with the Soviet Union in secret rearmament favored a pro-Soviet foreign policy, and had an extreme hatred for Poland. In 1928, Fritsch began work on the plan that became Fall Weiss, the invasion of Poland in 1939. He was promoted to major-general (Generalmajor) in 1932 by Kurt von Schleicher, who regarded him as a promising young officer. Schleicher then assigned Fritsch and Gerd von Rundstedt the duty of carrying out the Prussian coup that saw the Reichswehr oust the Social Democratic government of Prussia. After the Nazis came to power in 1933, Fritsch was a warm supporter of the new regime, which he saw as a radical force that, provided it was influenced by people like himself, would be a force for the good. Wette wrote that as Fritsch was a member of "...group of hardened anti-Semitics" in the officer corps, the anti-Semitism of Adolf Hitler was one of Fritsch's most important reasons for supporting the Nazi regime. Fritsch was promoted to Commander-in-Chief of the Army (Oberkommando des Heeres, or OKH), in February 1934 partly because Hitler saw him as a supporter of his regime and partly because the Defence Minister Werner von Blomberg valued Fritsch for his professionalism. 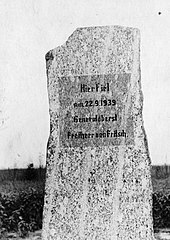 In February 1934, when Blomberg ordered that all soldiers who might be considered Jewish (that is, had at least a Jewish parent or grandparent who converted; long before the Nazis, the Reichswehr did not accept Jews) be given dishonorable discharges, Fritsch made no objection and carried out the order. According to William Shirer in The Rise and Fall of the Third Reich, Fritsch played a pivotal role when he balked at Hitler's initial overture to the Army to succeed ailing President von Hindenburg upon his death. Fritsch ultimately betrayed the officer corps to the Führer by agreeing to this demand after consulting with his generals. On 31 December 1934, Fritsch announced that it "goes without saying that an officer [should seek] a wife only within Aryan circles" and that any officer who married a Jewish woman would be dishonorably discharged at once. He was named Commander-in-Chief of the Army in 1935. In late 1934–early 1935, Fritsch and Blomberg successfully pressured Hitler into rehabilitating the name of the assassinated General von Schleicher, claiming that as officers they could not stand the press attacks portraying him as a traitor working for France. Fritsch supported the Nazi regime but he was antagonistic towards attempts to create rivals to the Army, especially the SS. Shirer recalled hearing Fritsch make sarcastic remarks about the SS, as well as several Nazi leaders from Hitler down, at a parade in Saarbrücken. He was also worried that Hitler would cause a war with the Soviet Union; like most of his fellow officers, he had supported the Weimar liaison with Moscow. Wette wrote that "It is indisputable that the conservative and nationalistically minded General von Fritsch affirmed the National Socialist state, and he accepted Hitler as a dictator fully and completely. Given this compatibility of outlook, one may doubt whether Fritsch's pronounced anti-Semitism reflected 'political naïveté' as the historian Klaus-Jürgen Müller [de] has asserted". In 1936, when Blomberg was promoted to field marshal, Fritsch received promotion to Blomberg's vacated rank of colonel general (Generaloberst). Fritsch was among the officers present at the Hossbach Conference in 1937 where Hitler announced that he wanted to go to war as early as 1938. He was very critical of this demand, as he knew the army was not ready. Heinrich Himmler and Hermann Göring—inspired by the resignation of Blomberg—accused the unmarried Fritsch of engaging in homosexual activity. Fritsch had never been a womaniser and had preferred to concentrate on his army career. He was forced to resign on 4 February 1938. His replacement—Walther von Brauchitsch—was recommended for the post by Fritsch. Hitler took advantage of the situation through the replacement of several generals and ministers with Nazi loyalists, which strengthened his control of the German Armed Forces (Wehrmacht). It soon became known that the charges were false, and an honour court of officers examined the Blomberg–Fritsch Affair, although it was presided over by Göring himself. The successful annexation of Austria into Greater Germany (Anschluss) of 12 March silenced all critics of Hitler, Göring and Himmler. Fritsch was acquitted on 18 March, but the damage to his name had been done. "It is very strange that so many people should regard the future with growing apprehension, in spite of the Führer's indisputable successes in the past...Soon after the War, I came to the conclusion that we have to be victorious in three battles, if Germany were again to be powerful:. We are in the midst of these battles, and the one against the Jews is the most difficult. I hope everyone realizes the intricacies of this campaign." Fritsch told Ulrich von Hassell—when the latter tried to involve him in an anti-Nazi plot—that Hitler was Germany's destiny, and nothing could be done to change that fact. Fritsch received a ceremonial state funeral four days later in Berlin. William Shirer covers the event in his diary entry dated 26 September 1939. "They buried General von Fritsch here this morning. It rained, it was cold and dark – one of the dreariest days I can remember in Berlin. Hitler did not show up, nor Ribbentrop, nor Himmler, though they all returned to Berlin from the front this afternoon." ^ a b c d Wette, Wolfram The Wehrmacht Cambridge: Harvard University Press, 2006 page 83. ^ a b c d e Wheeler-Bennett, John The Nemesis of Power, London: Macmillan, 1967 page 302. ^ Wheeler-Bennett, John The Nemesis of Power, London: Macmillan, 1967 page 293. ^ a b Wette, Wolfram The Wehrmacht Cambridge: Harvard University Press, 2006 page 84. ^ Wheeler-Bennett, John The Nemesis of Power, London: Macmillan, 1967 page 303. ^ Wette, Wolfram The Wehrmacht Cambridge: Harvard University Press, 2006 page 72. ^ Shirer, William (1960). The Rise and Fall of the Third Reich. Simon and Schuster. pp. 214–215. ^ Wheeler-Bennett, John The Nemesis of Power, London: Macmillan, 1967 page 336. ^ Wette, Wolfram The Wehrmacht Cambridge: Harvard University Press, 2006 page 85. ^ Deutsch, Harold. Hitler and His Generals: The Hidden Crisis. January – June 1938. Minneapolis: University of Minnesota, 1974. p 365-68. ^ Wheeler-Bennett, John The Nemesis of Power, London: Macmillan, 1967 page 494. ^ Wheeler-Bennett, John The Nemesis of Power, London: Macmillan, 1967 page 433. ^ Wheeler-Bennett, John The Nemesis of Power, London: Macmillan, 1967 pages 379–380. ^ Wheeler-Bennett, John The Nemesis of Power, London: Macmillan, 1967 page 380. ^ "Darmstadt garrison bids Germany farewell". This page was last edited on 16 March 2019, at 20:32 (UTC).